We already have delivered adaptations of some of our News and Weather TTS applications for both Asterisk and 3CX platforms. But there are other occasions where you may want to build interactive IVRs or custom applications that require custom voice prompts to obtain information from callers such as requests for a name, a phone number, a part number, a location, a department, or many other pieces of data that are used to formulate data base queries. 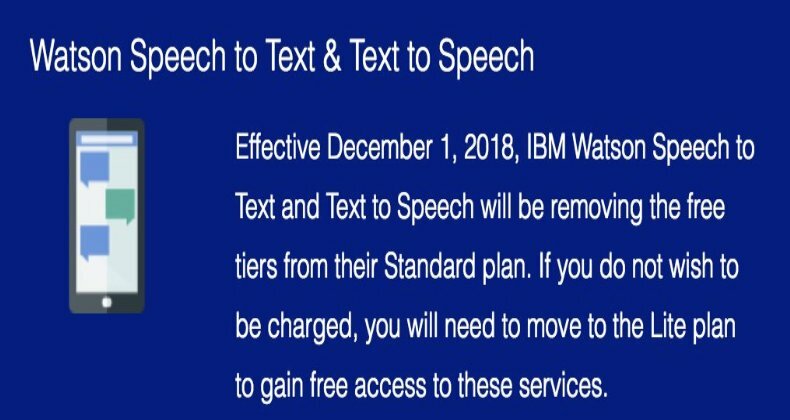 And now there’s a simple, professional, and free way to create these voice prompts using IBM’s TTS platform and Incredible PBX® 13-13. 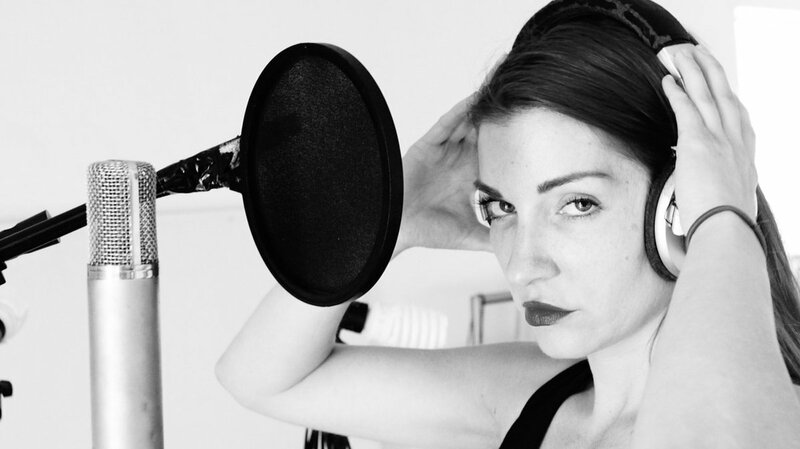 The first million characters of TTS synthesis and the resultant voice files are free every month. That will be more than ample for almost all of our users. To get started, you’ll need to set up a free account with IBM Bluemix and install Incredible PBX 13-13 on a platform of your choice: a dedicated server, a virtual machine on your desktop PC using VirtualBox, or a cloud-based server. You can start your free, 30-day trial of IBM Bluemix services without providing a credit card. Just sign up here. Once your account is activated, here’s how to obtain credentials for the TTS service to use with Incredible PBX 13-13. Start by logging in to your IBM Bluemix account. Once you’re logged in, click on your account name (1) in the upper right corner of your web page to reveal the pull-down to select your Region, Organization, and Space. 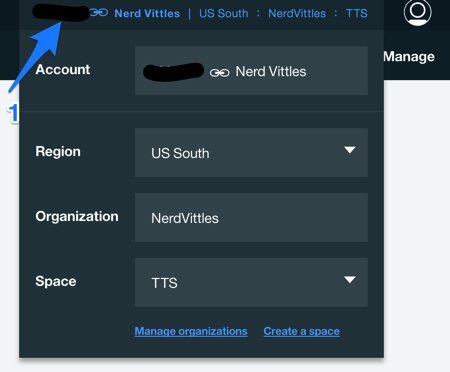 Follow the blue links at the bottom of the pull-down menu to create an Organization and Space for TTS. Next, click the Menu icon which is displayed as three horizontal bars on the left side of the web page. Choose Watson. Click Create Watson Service and select Text to Speech from the applications listing. Watson will generate a new TTS service template and display it. Make certain that your Region, Organization, and Space are shown correctly. Then verify that the Standard Pricing Plan is selected. When everything is correct, click the Create button. When your Text to Speech application displays, click Service Credentials and then click New Credential (+). When the Add New Credential dialog appears, leave the default settings as they are and click Add. Your Credentials Listing then will appear. Click View Credentials beside the new entry you just created. Write down your URL, username, and password. You’ll need these later to configure the IBM Bluemix TTS service. Logout of the IBM Cloud by clicking on the little face in the upper right corner of your browser window and choose Log Out. Confirm that you do, indeed, wish to log out. Using your favorite editor, it’s time to add your IBM TTS credentials to the Voice Prompt script: nano -w ibmprompt.php. Simply replace the x’s in $IBM_username and $IBM_password with your credentials from above. 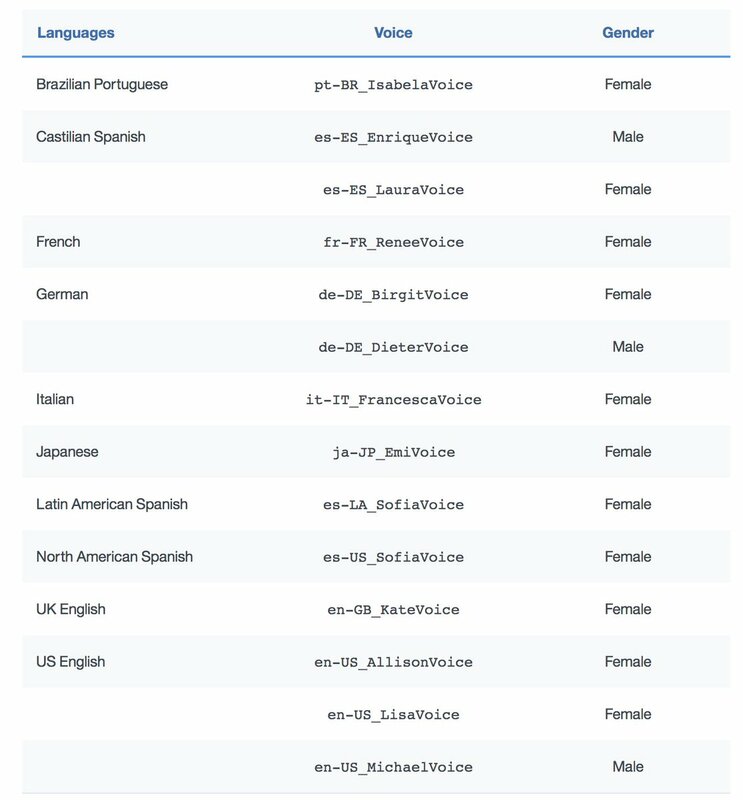 If you prefer a different voice for your voice prompts, update the $IBM_voice option using the examples shown below. 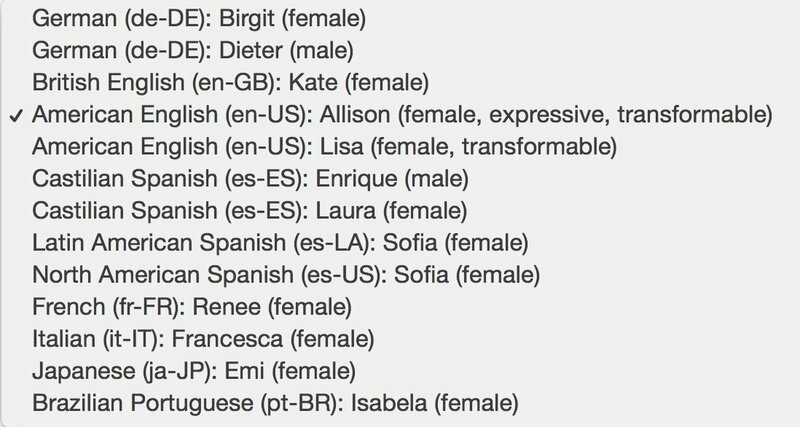 For example, for the Brazilian Portuguese voice, use $IBM_voice = "pt-BR_IsabelaVoice". Verify that the $IBM_url matches what was provided with your credentials. Once you’ve updated the entries, save the file: Ctrl-X, Y, and ENTER. Now we’re ready to try thing out. The syntax while logged into the /root folder looks like this. If creating a prompt in a different language, text should be in native language, not English. ./ibmprompt.php "Text of your voice prompt"
Once the voice prompt is generated, you’ll find voiceprompt.wav in the /root folder. You can rename it and move it to a suitable location to meet your requirements. Enjoy! Support Issues. With any application as sophisticated as this one, you’re bound to have questions. Blog comments are a terrible place to handle support issues although we welcome general comments about our articles and software. If you have particular support issues, we encourage you to get actively involved in the PBX in a Flash Forums. It’s the best Asterisk tech support site in the business, and it’s all free! Please have a look and post your support questions there. Unlike some forums, ours is extremely friendly and is supported by literally hundreds of Asterisk and 3CX gurus and thousands of users just like you. You won’t have to wait long for an answer to your question. Need help with Asterisk or 3CX? Visit the PBX in a Flash Forum.